This “Bloom in the Sky” Archival Digital Fine Art captures the original pastel painting with all the transparencies of the sun shining through the leaves. I was lying down in the grass looking up this tree and the transparencies of the leaves of this Apple Pitch Tree against the light blue sky on this sunny day to create “Bloom in the Sky”. I was entranced with the natural flow of the leaves and branches which led me to start sketching for a painting. The pink flowers bloom on the top just intrigued me. The exciting part of this painting is the perspective. After I finished this sunlit painting I created this “Bloom in the Sky” Archival Digital Fine Art as way for more people to experience our sun with its effervescence hues from above touching the leaves and branches. 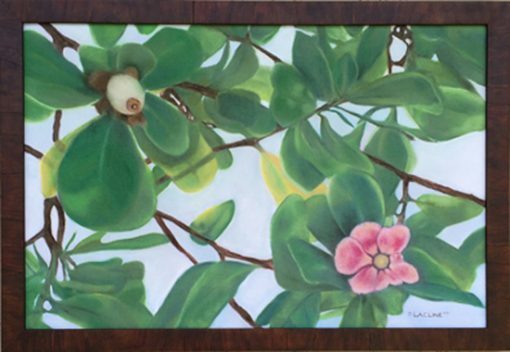 It was exciting to Re-create this painting once again using different texture for the branches and using pastels. I hand painted the branches with acrylic mixed with a thickener to give this one of a kind artwork texture. I also hand rubbed the pastels of the original painting into the canvas of the new art. This art is archival spayed to protect the art against UV rays. If you have any questions about this piece call or email me. I would be delighted to speak with you.